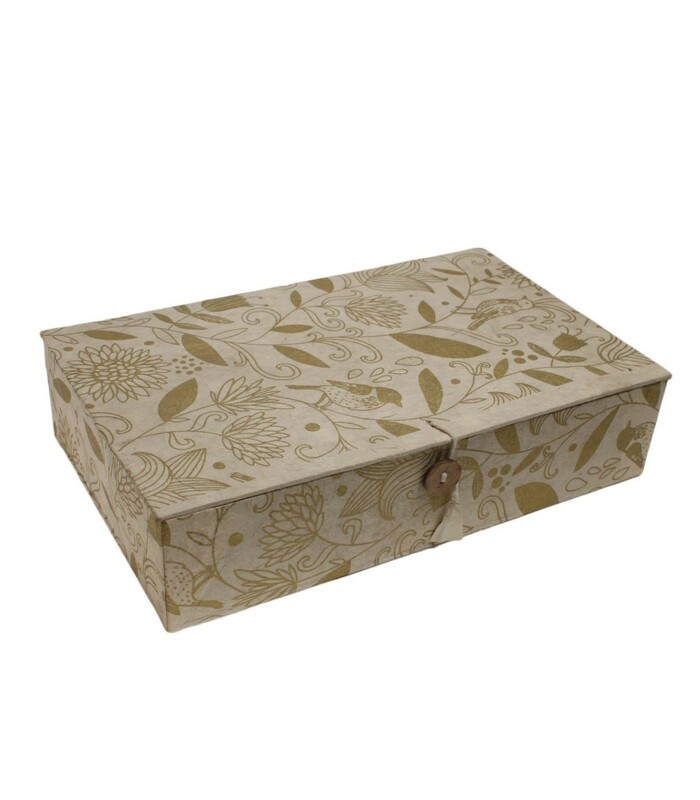 This box is eco-friendly and is handmade. 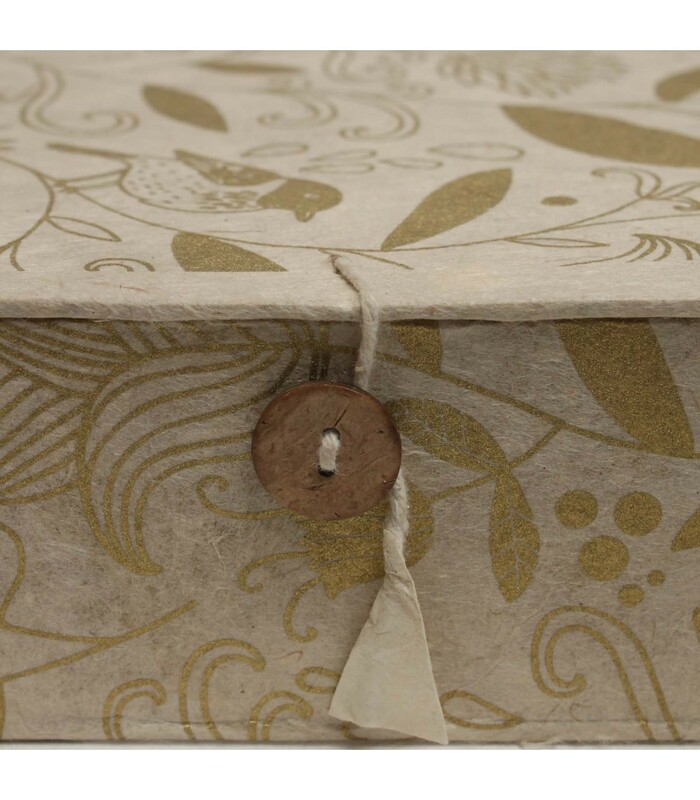 The box is made from hard cardboard paper and is wrapped with beautiful chirping birds and floral printed lokta paper. The lid is secured with wooden button. You can put your jewelleries, colours, your collection items inside the box. The container is perfect for organizing your dresser. The minimum purchase order quantity for the product is 3. Minimum order value must be above US $499. Get additional 10% discount on order of US $999 or more. This item is handmade. As with all handcrafted work, it creates variations in color, size and design. Slight difference can be expected from one piece to other. Also color discrepancies may occur between this product and your computer screen. Product is made in Nepal. * We are an online wholesale handicrafts store for small retailers. Free door to door shipping is available for total order (i.e. cart total) of US $499 or more. For total orders less than US $499, shipping charge of US $100 will be applied. An order is shipped via door to door courier company (e.g. Aramex, Skynet, DHL, UPS etc). Shipment usually takes 4 to 7 business days to arrive at the most destinations. We will provide you with tracking details. Please note courier company requires a signature to receive the goods. Hence please specify a delivery address where someone will be available during normal office hours to sign for the order. You can make an online payment with major credit cards through PayPal which is leading payment gateway. You do not need to have a PayPal account to complete this payment method. Your privacy and security are assured through PayPal. Please note that our parent company is "AGSLN ApS" which is the name that will be shown on the PayPal site or your billing statement. You can also make payment via wire transfer. The option is available at checkout. Please note that order will only be processed after receiving payment to our account which could take 3 to 4 business days.